The two newest members of the Buffalo Baseball Hall of Fame are former Bisons manager, Marty Brown and former Herd pitcher, Joe Roa! Jacome and Ryal will be formally inducted into the Buffalo Baseball Hall of Fame during ceremonies held on the Bisons Honda fridaynigthbash! on Friday, June 30. CLICK HERE to read the official announcement with their accomplishments. CLICK HERE for tickets to the Bisons Honda fridaynightbash! game on Friday, August 10. The Buffalo Baseball Hall of Fame represents such persons who have made a significant contribution to Buffalo professional baseball, or such Western New Yorkers who have made a meaningful contribution to professional baseball generally. The Buffalo Baseball Hall of Fame was established in 1985 in conjunction with Buffalo Baseball's 100th anniversary celebration. 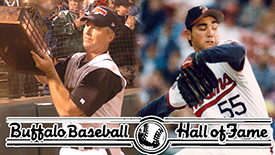 Each year, the Hall of Fame Committee nominates names for suggested induction onto the preliminary ballot. Finalists are selected by a secret ballot, where a three-quarters vote of the committee is required for induction. The plaques for all 100 members of the Buffalo Baseball Hall of Fame can be viewed during all Bisons home games at Coca-Cola Field's Hall of Fame Room, presented by ADPRO sports. The room is located on the 3B side of the ballpark by Section 107. The room is open when ballpark gates open through the 3rd inning of each game. Throughout the Bisons season, the Hall of Fame Room will feature different exhibitions from the history of the Buffalo Bisons, as well as great items from the history of baseball in Buffalo. The Buffalo Bisons are always in search of great and unique items from their 134-year history to add to the Hall of Fame Room at Coca-Cola Field. Have something you want to see preserved in the best possible place? Email info@bisons.com and we'd be happy to accept your donated items. Below are all 100 members of the Buffalo Baseball Hall of Fame. Next to each name is the year the individual was inducted into the Hall of Fame. *CLICK ON EACH NAME to pull up the Hall of Fame Plaque that hangs in the Buffalo Baseball Hall of Fame. Plaques for this year's class will be added once they are unveiled. The Buffalo Baseball Hall of Fame Committee is comprised of Mike Buczkowski, Tom Burns, Bob Dicesare, Mike Harrington, Kevin Lester, Duke McGuire, Bob Miske and Pete Weber.